When a soldier returns home wounded–grappling with PTS and plagued by nightmares–he may struggle to feel connected to his wife. Married couples who have been close for years, even decades, who are used to trading secrets and sharing life-altering experiences, suddenly feel like they are from different planets. Even like they’re living on different planets. The space seems vast, and the silence seems deafening. Jane was grateful that she’d had the chance to travel when she was younger, because when her life changed and she was convinced her globe-trotting days were over, she felt content to stay home and care for her husband and grandkids. But just when Jane had resigned herself to letting go of traveling and adventures, Kyle told her about National Ability Center. And in the blink of an eye, they were packing their bags to go to Park City. The National Ability Center provides rehabilitation sports training to severely wounded warriors and their wives. Jane was excited about this organization because although it was focused on helping her husband heal, she got to participate too. 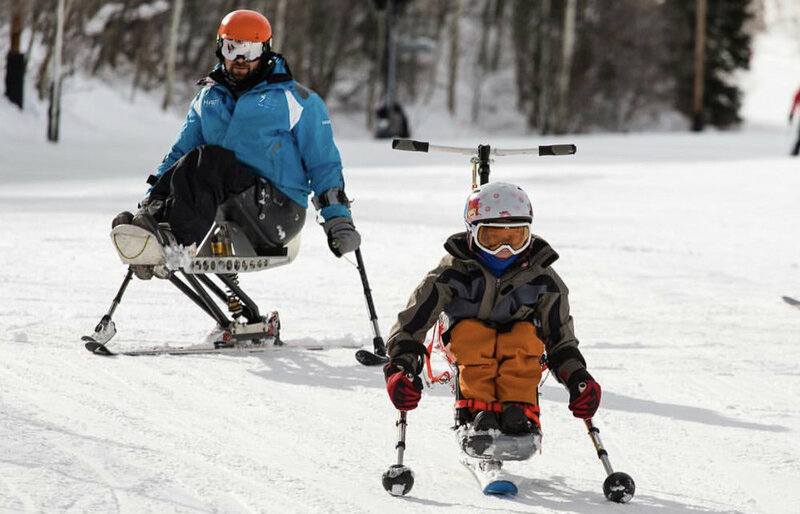 Kyle’s instructors at the National Ability Center strapped him into a monoski and put him on Deer Valley’s bunny hill, while Jane skied along with him. She watched him open up and transform before her eyes. This program got him out of his shell and added a new dimension to their life through their shared love of the outdoors. The healing process is a journey that lasts a lifetime—for wounded warriors and their caregivers. The four days Jane spent with Kyle in Park city skiing and sharing meals with other Wounded Warriors and their wives was a turning point in both of their lives. They met skiing, and it was skiing that brought them back together again. Now these two are healing their wounded souls through sharing new positive experiences, and gently forcing a world that can feel small and suffocating to expand and unfold.